One of the best ways to save money is printing offshore by manufacturing offshore/overseas and delivering the finished items to your door upon completion. Not all jobs are suited to offshore production. Let’s discuss the merits. We will guide you. Printing Offshore requires experience. Barneys Print has this experience. Listed below are benefits to consider. These will ensure the success of your business. Located in Guangzhou, China is Barney’s Australian trained working and overseeing your jobs in the local China factories. 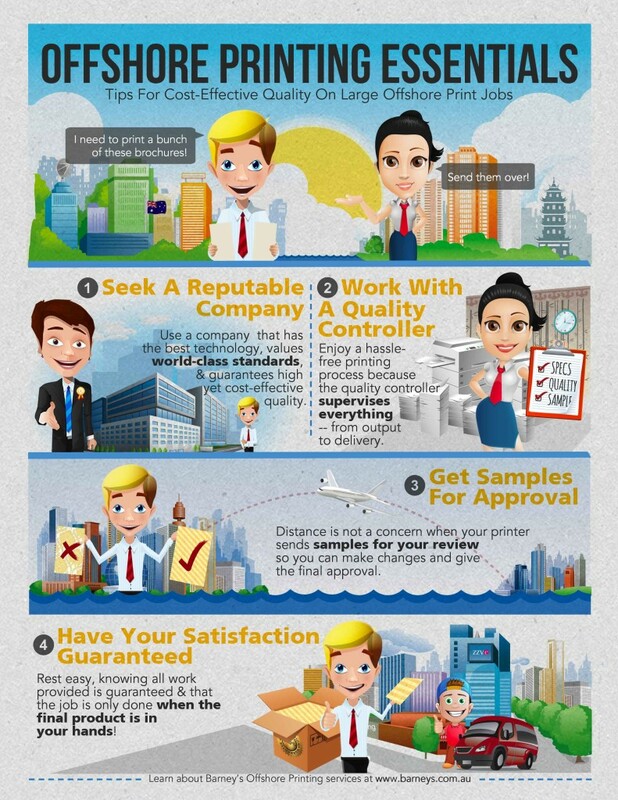 This ensures the quality of your printing offshore. There is nothing worse than receiving your goods and finding half of them have been printed with poor colour management. You will receive photos, proofs, mock ups and samples during production of your job to ensure the job meets the specifications and the standards of quality you expect. Relationships are well established in many factories and the best factories have been chosen by us. Our team speak and write both English and local Chinese languages. Not speaking the local language or understanding the culture is often a barrier to trade that many others attempt often with mixed outcomes. Cultural standards and values are easily dealt with by our overseas team who themselves are Nationals in China. We can source from factories that don’t necessarily speak English enlarging the pool of suppliers to choose from whilst maintaining competitive pricing. Freight and shipping logistics are calculated and managed for you in both the port of origin and destination. All jobs are quoted in Australian dollars and you do not have to worry about currency conversion and fluctuating exchange rates. We use the latest technology to ensure clear communication, swift quotes and precise tracking of your job. Packing of your goods is done with great care so it arrives in perfect condition. Our local team check to ensure this is so. One of our specialties as it happens, is UV printed bumper stickers. It’s one of those items that we do such a good job of in China. Another very popular item happens to be baseball caps and hats. If you’re looking at bulk promotional caps produced offshore then hit us up via our sister website Fast Caps.